Last week Walgreens had a great sale on all Sinful Colors nail polishes. This is a brand that is fairly cheap already ($1.99) but a dollar off is a dollar off, right? I has two swaps to think about so I tried not to go overboard and buy a ton of polishes! I ended up purchasing about 8 or 9, in the end. Their polishes come in gorgeous colors and the formulation isn't bad- some colors apply evenly with just one coat! 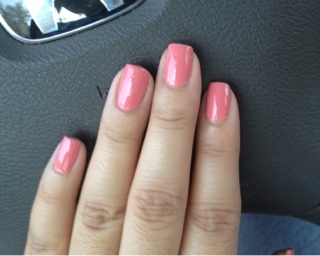 This color stood out to me since I love all things peachy- coral. Soulmate is a perfect salmon coral color- I applied two coats but would have been okay with just one, as it's a bit thick. But it's gorgeous nonetheless! Did anyone pick up any during Walgreens sale? Any summer polish recommendations? I've been wearing since I bought and love it! Hope you like it! I've seen sooo many pretty shades by Sinful Colours that i want to get my hands on but they don't sell this brand in the uk. When i'm next in the US is definitely something i want to stock up on :D This is such a pretty colour!! They are fun:) I'll def find you on twitter so we can talk more about it!